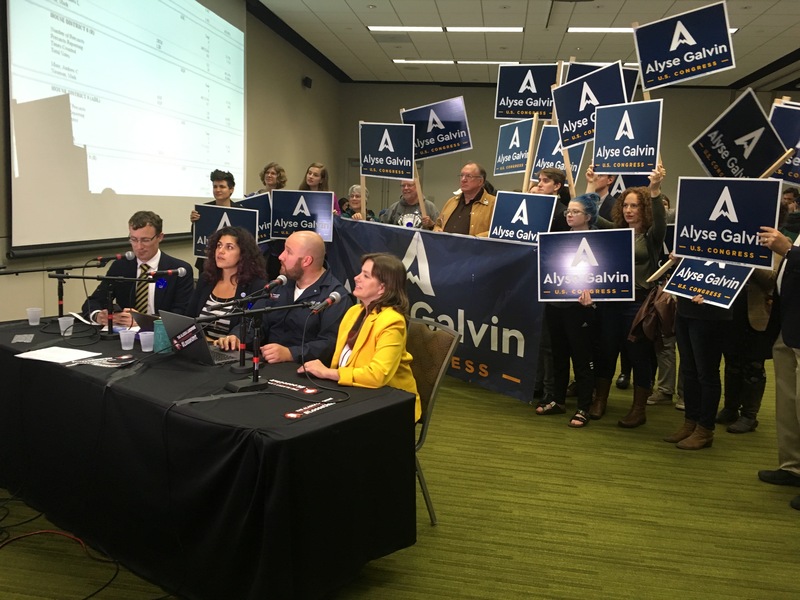 In the Democratic Primary for the U.S. House, independent Alyse Galvin soundly defeated Dimitri Shein and two others candidates for the chance to go up against the Republican incumbent, Congressman Don Young. Shein was at Mad Myrna’s, a bar on East Fifth Avenue, as the first returns rolled in. He could’ve taken comfort in the Bob Dylan song wafting out of the karaoke room. For the loser now will be later to win. For the Times they are a changin’. Shein didn’t win a spot on the November ballot. But he said there actually is something of a prize for finishing second. A mile away, Galvin and a throng of supporters flooded into the Dena’ina Center for a media-sponsored election-watch event. Galvin told her volunteers this was their victory. “Got a little work to do tomorrow and thereafter. But we’re game for it, right?” Galvin said, to cheers. Galvin said about half of her volunteers, and half of her staff, have never been involved in a campaign before, and this is Galvin’s first run for office. She said opposition to President Trump is a motivating factor. “People are pretty frustrated and full of angst, particularly in light of the fact that Don Young has not responded to many of the things that Don Trump has done,” Galvin said. She said Young hasn’t stood up to Trump on the tariff war with China, a big market for Alaska seafood. And, Galvin said, Young was quiet after the Helsinki summit, when Trump seemed to side with Russian President Vladimir Putin over American intelligence agencies. Young voted in his hometown of Fort Yukon on Tuesday. He easily won his Republican primary. His campaign issued a press release afterward saying he was humbled by the support and wants to continue his work fighting for Alaskan interests in Washington, D.C.
His press release doesn’t mention Galvin. Young is now the most senior member of Congress. He’s been vanquishing Democratic nominees since 1973. Galvin, though, thinks she’s the one who can beat him. She said she’s been in regular talks with Emily’s List and Planned Parenthood’s political arm – two groups that could boost her campaign coffers. And the Democratic National Committee issued a post-election statement embracing her. And that, as it happens, was the theme at Mad Myrnah’s, too.